Jason Plato has taken pole position in a wet Dunlop MSA British Touring Car Championship qualifying session at the Knockhill circuit in Fife. Plato set a best time of 57.128s in his KX Momentum Racing MG6 to secure pole for the third time this season. Qualifying second fastest was Robert Collard in his eBay Motors BMW while young Irishman Aron Smith was a best-ever third in his Redstone Racing Ford Focus. But Plato’s two Honda rivals, Worcestershire’s Matt Neal and Scottish ‘home hero’ Gordon Shedden who lay just ahead of him in the title race, could only manage eighth and sixth places. It means Plato, chasing the third title of his career, has a golden opportunity to make further inroads into their advantage in the first of tomorrow’s three races at least. They will go into it with Neal, the reigning Champion, leading the standings with Shedden in second and Plato third. Just ten points cover them with 20 awarded for a win. Elsewhere ‘returnee’ Paul O’Neill qualified an excellent seventh fastest in his Speedworks Motorsport Toyota Avensis. Inverness’s Dave Newsham, a winner for the first time at Snetterton, Norfolk two weeks ago, was tenth on his home track in his Team ES Racing.com Vauxhall Vectra. Tomorrow’s three BTCC races from Knockhill will be shown live on ITV4, ITV4 HD and www.itv.com during a mammoth seven hour show from 11.00am-6.00pm. 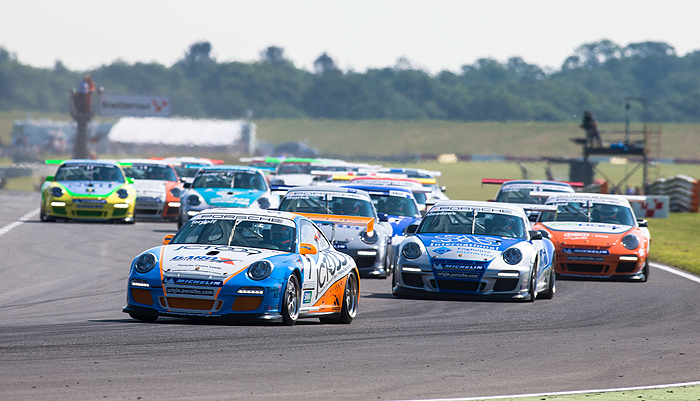 The Porsches attack the first corner of Snetterton. 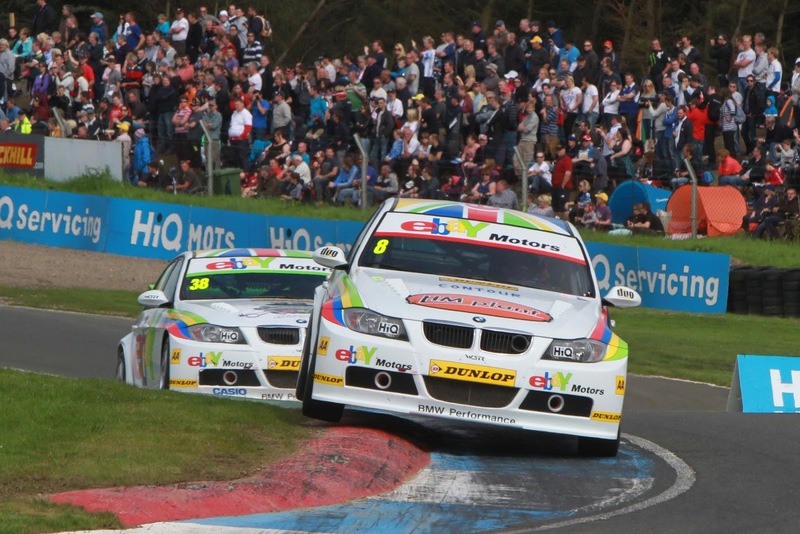 More spectacular action at Knockhill! Rounds 13 and 14 of the Porsche Carrera Cup GB are sure to deliver some of the most exciting and unpredictable racing of the season as the teams and drivers take on the unique challenge of the Knockhill circuit in Fife (25/26 August). Michael Meadows (Redline Racing) heads north with a 36-point lead in the overall standings and is clearly the title favourite. But Michael knows well enough that Knockhill is one of those tracks where fortunes can change very quickly and he will be working very hard to make sure he qualifies at the front of the pack. Last time out at Snetterton was a fabulous weekend for Sam Tordoff (Team Parker Racing), who dominated the weekend to take two wins and move into second place overall at the expense of Jonas Gelzinis (Juta Racing). Aside from Gelzinis, three drivers are vying to topple Tordoff as the big threat to Meadows and Daniel Lloyd (Team Parker Racing) and Ben Barker (Parr Motorsport) could both be race winners. Series newcomer Andy Meyrick (Team Parker Racing) will surely be quick on his first race weekend at Knockhill but it is local ace Rory Butcher (Celtic Speed) who will really want to stamp his mark on the weekend. As the Carrera Cup GB makes its annual foray north of the border, five Scottish drivers will be on the grid. Top of the pack in terms of overall championship position is Butcher and he has a pretty good knowledge of Knockhill. The son of circuit owner Derek and brother-in-law of BTCC ace Gordon Shedden, Kirkcaldy-based Rory is a Knockhill instructor. Rory had the weekend of his life in June at Croft when he was in dominant form and won both races with two perfect performances. Add that to consistent scores elsewhere and he is now fourth in the points, within striking distance of second-placed Tordoff. Also running in the Pro category is Aberdeen’s Glynn Geddie (Redline Racing). By his own high standards, 2012 has yet to deliver the results that were expected, but Knockhill is just the sort of track where Glynn’s natural pace and gutsy style could shine. 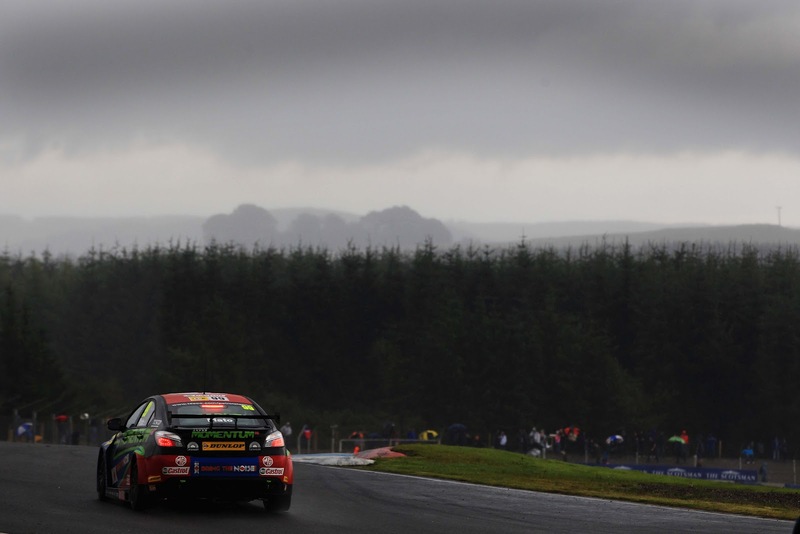 If the weather is unpredictable, as can be the case at Knockhill, he will be right in the mix. Battling for glory in Pro-Am1 are West Kilbride’s Derek Pierce (JD Pierce with Team Parker) and Edinburgh’s Oly Mortimer (GT Marques). Pierce is badly overdue some good luck to go with his undoubted pace, while Mortimer and the team have been working wonders on a very limited budget. Currently, Pierce heads Mortimer by a single-point as they chase Pro-Am1 leader Ahmad Al Harthy (Redline/Oman Air). 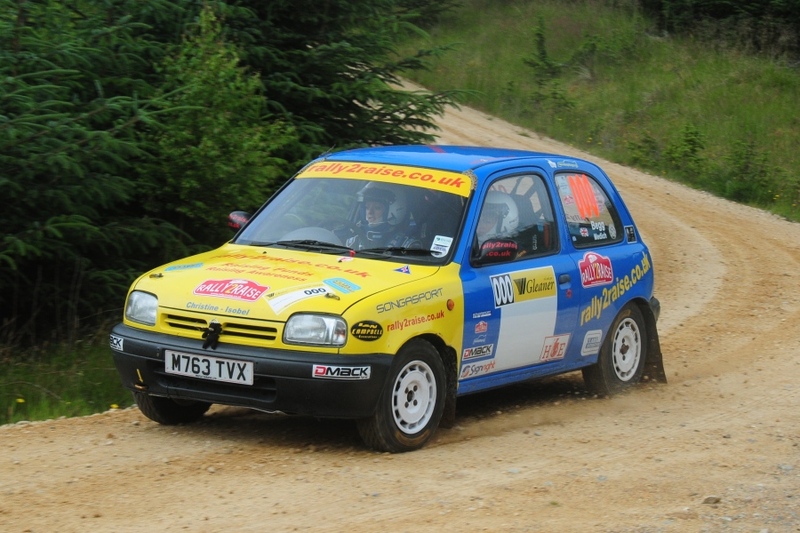 Completing the Scottish contingent is Edinburgh’s George Brewster in the second car from Montrose-based Celtic Speed. The former Pro-Am2 champion is only tackling a part season this year due to business commitments, but will be aiming for a visit to the Pro-Am1 podium on home ground. Finally, the contest for Pro-Am2 glory is set to be between Welsh teenager Fraser O’Brien (GT Marques) and Tania Mann (sibsport performance). O’Brien made an impressive series debut last time out at Snetterton and will now tackle Knockhill for the first time. After qualifying at 13.50 on Saturday, round 13 will start at 10.45 on Sunday, with round 14 at 15.30. Round 14 will be broadcast live on ITV4 during the extensive BTCC programme which runs from 11.00 on Sunday. ...And it's not what you might have thought it would be. One half of the Wheeler Dealers team joins up with Tom Onslow-Cole to transform, of all things, a Milk Float, into a racing car. And you get no prizes for guessing where they found that! eBay Motors launches its Mechanics Challenge at Snetterton with British Touring Car Championship (BTCC) star Tom Onslow-Cole and TV motoring expert Edd China to highlight the wealth of automotive parts on the site. What on earth are we going to do with this? eBay Motors challenges Tom and Edd to turn a milk float into a race car using parts and accessories from eBay Motors, the UK’s leading online automotive marketplace with more than 18 million listings and 250,000 cars and motorcycles for sale. During the next month Edd will work with the eBay Motors BTCC team engineers in a challenge that will showcase their skills as top mechanics and the huge range of parts and accessories available on eBay Motors. 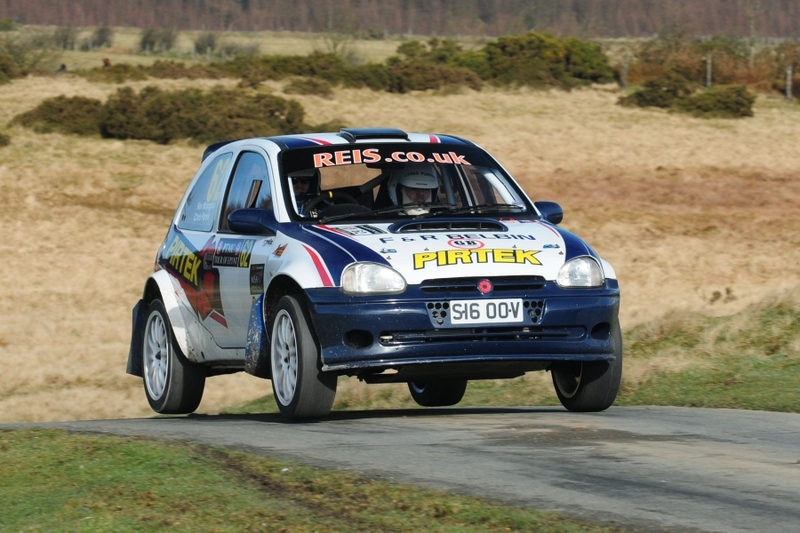 The activity culminates in September with Tom behind the wheel in an exciting final test. 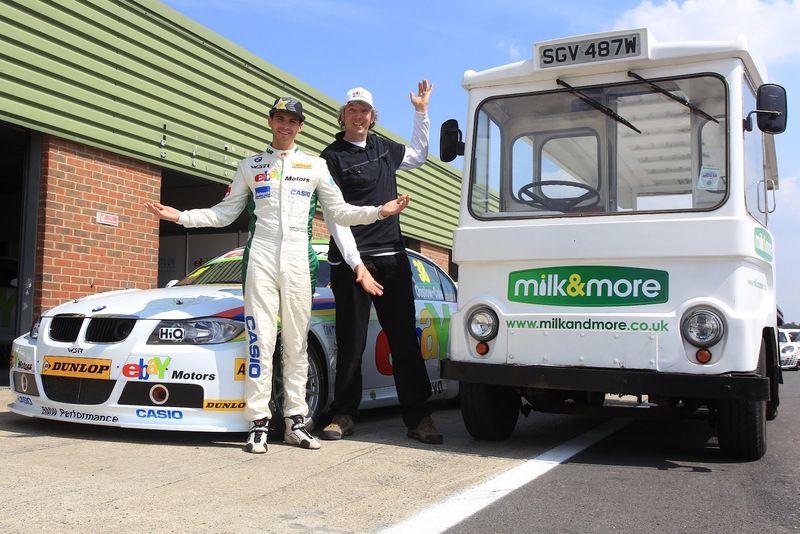 BTCC fans and motoring enthusiasts will vote on the parts and accessories from eBay Motors that will be used to transform the milk float into a race car. 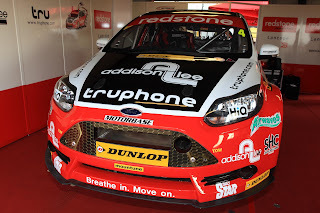 The finished car will be on display for fans at the final BTCC round at Silverstone on the 7th October 2012. This probably goes a bit slower than Tom's BMW. The optional Edd attachment is likely to add a bit of drag too! This is eBay’s third season involved in the 2012 Dunlop MSA British Touring Car Championship (BTCC), although the first as title sponsor of the team. Rob Collard, Nick Foster and Tom Onslow-Cole are the three drivers in 2012, and the team is currently lying in first place in this season’s Independent Team Championship. This is just about the only way you can see Formula Renault in the UK this year, and where better than Donington? Britain’s most popular and hotly contested one-make single-seater category, the Protyre Formula Renault BARC Championship, returns to action at Donington Park next weekend, 18th/19th August, for a bumper three-race outing – an event which could prove pivotal to the destiny of the 2012 title. With five races remaining, and a possible 170 points up for grabs, the championship is still wide open but two drivers have started to emerge as the main contenders, Cullen Motorsport’s Scott Malvern (Barkingside, Ilford) and MGR Motorsport’s Josh Webster (Stowmarket, Suffolk). Ahead of rounds 10, 11 and 12, two-time McLaren Autosport BRDC Award finalist Malvern holds a slender seven point advantage over his younger rival. Webster took a pair of faultless victories last time out to reignite his challenge but Donington Park’s National Circuit, unlike Croft and Thruxton the two previous venues on the calendar, is a track Malvern has prior experience of. 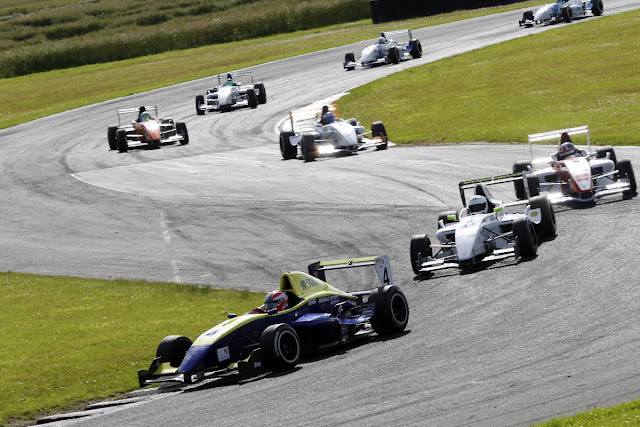 While both drivers are a long way clear of the tightly bunched chasing pack, third placed Seb Morris (Marford, Wrexham) has taken three wins so far in his maiden year of single-seater racing and will undoubtedly be a threat at Donington. Some serious misfortune at both Thruxton and Croft, which resulted in two non-finishes, has dented the 16-year-old’s title aspirations and ahead of next weekend’s penultimate race meeting of the year the Fortec Motorsports driver is 73 points adrift of Malvern. Next up is MGR’s David Wagner (Glasgow) who edged three points ahead of Scorpio Motorsport’s Macaulay Walsh (Northampton) at Croft last month. Walsh, in his first full season of car racing, endured a desperately unlucky event in which he retired from the first race with damage and only scored four points in the second encounter after a driveshaft failure prior to the start. Wagner, meanwhile, had one of his strongest weekends of the year with a welcome return to the podium in round nine, his first visit to the rostrum since the opening race of 2012. The series top six is then rounded-out by MGR’s James Fletcher (Windlesham, Surrey) and Hillspeed’s Kieran Vernon (West Chiltington, West Sussex) who are tied on points after both enjoying podium success at Croft. Among the expected 26 car grid for the Protyre Formula Renault BARC Championship’s annual visit to Leicestershire will be two new faces, 17-year-old Struan Moore (Trinity, Jersey) and 16-year-old American-Norwegian national Falco Wauer. Not only will next weekend’s races with Hillspeed mark Moore’s single-seater debut, the event will also see a long overdue return to competitive action for the teenager who last raced in the Ginetta Junior Championship in 2011 where he accrued several podium finishes. Wauer, who will be the youngest driver on the grid, is to compete with Cliff Dempsey Racing and despite his age he already has a reasonable amount of single-seater experience – namely in Formula Ford, Formula 4 and the Norwegian Formula Basic series. Qualifying for rounds 10, 11 and 12 of the 2012 Protyre Formula Renault BARC Championship will get underway at 10.30 next Saturday, 18th August, with the first of the weekend’s races beginning at 15.50. Rounds 11 and 12 will follow on Sunday, 19th August, at 11.50 and 16.50 respectively. Dave Newsham collects the first place trophy for the first time! 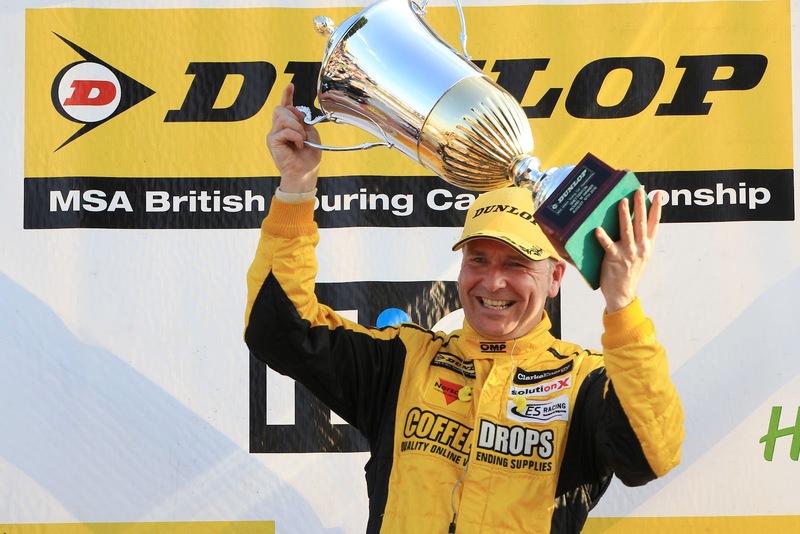 12 August 2012 will be a day etched in Luton-based Team ES Racing history as Dave Newsham took his and the teams’ maiden victory in the Dunlop MSA British Touring Car Championship at Snetterton. The weekend didn’t start ideally for Newsham when he retired from the first practice session early with radiator problems, but he soon made up for lost time as he qualified third place just 0.054 seconds from pole position. Race one saw Newsham drive a strong race to finish fourth only to be disqualified after stewards deemed the car to be underweight after a miscalculation with fuel. Newsham had it all to do again in the second race as he started from last on the grid, his steady pace saw him move up through the field to finish a strong eighth place, securing second place on the grid for the final race of the day as 9 was drawn for the reverse grid. After initially losing out to the BMW of Tom Onslow-Cole at the start Newsham pushed hard to build the pace and take back his second place by the end of the first lap. His pace would prove relentless as he found a gap to pass Lea wood in to the hairpin for the top spot, from that moment Newsham never looked back. “I thought we might be able to do something like this this weekend if everything went in to place. We had great pace in qualifying and practice, no testing in between the last race, it’s just awesome isn’t it.” commented Newsham after the race. Team mate and team principal Chris James suffered a disappointing weekend that involved delaminated tyres in qualifying, broken driveshafts and a number of collisions where James was hit from behind. Despite his own disappointment James was delighted at the performance of Newsham to take his team the top spot of the podium. James Birch takes the lead into Donington Park... will he remain there afterwards? The fabulous sweeps of Donington Park await contenders in the Porsche GT3 Cup Challenge GB for rounds nine and ten of the 12-race season (18/19 August). With only the final two races of the season at Silverstone to follow, championship leader James Birch will be striving to maintain or even extend his overall advantage. The Porsche GT3 Cup Challenge is managed by Porsche Cars GB alongside the Carrera Cup GB and is growing as the season develops, with steadily building competitor interest. The series gained championship status this year for the six-event, 12-race season and is for the cars from 2009 or before, including the 996-model cars from up to 2006. Heading the GT3 Cup Challenge GB entry into rounds nine and ten will be championship leader Birch (GT Marques), who is enjoying a stunning season with five wins and two seconds from eight races to date. The Buckinghamshire racer heads to Donington with a 20-point lead and will need to build that to at least 45 points by the end of the Donington weekend to clinch the title. More probable is that the title contest will be resolved in front of the BTCC crowds at Silverstone over the weekend of 6/7 October. Last time out at Croft, two drivers kept Birch away from the top step of the podium as Justin Sherwood and Steven Liquorish each took a win for Team Parker Racing. It is Liquorish who is really taking the fight to Birch across the season and his second win of the campaign in the most recent race at Croft shows that Liquorish is still very much in the title race. He now needs to peg back Birch’s points’ lead at Donington to ensure a cliff-hanging finish at Silverstone. Although he has not contested all the races this season, former F3 racer Sherwood has shown excellent pace and he will be firmly on home ground at Donington, so expect him to be very rapid. Meanwhile, making a welcome return to the GT3 Cup Challenge after missing a couple of events is Peter Smallwood (Parr Motorsport) and he is another driver with overall podium ambitions. John Ferguson (ASK Racing) could be a dark horse in the battle for overall wins having shown strong pace at unfamiliar circuits over recent races. Donington should suit the Birmingham-based Irishman and he has the pace to rival Birch, Liquorish and Sherwood at the very head of the contest. Joining Ferguson in the Dublin-based ASK Racing squad is Tom Hallissey in the team’s Class Two 996-model 911 GT3 Cup. Now running third overall in what is proving to be a remarkable debut season of racing is Mark Cowne (Parr Motorsport), while back on track after missing the Croft races will be Mark Flaherty (Redline Racing). After qualifying at 11.15 on Saturday, round nine will start at 16.30, with round ten at 13.45 on Sunday. Both races will be filmed for transmission on the Porsche Origin website and Porsche’s YouTube channel. Overall: 1 James Birch, 149; 2 Steven Liquorish, 129; 3 Mark Cowne, 90; 4 John Ferguson, 69; 5 Justin Sherwood, 63; 6 Neil Houston, 60; etc. Class 2: 1 Mark Cowne, 28; 2 Tom Hallissey, 11. Andrew Jordan grabbing the lead to win today's second, highly dramatic second race at Snetterton. Jason Plato, Andrew Jordan and, for the first time, Dave Newsham shared the wins in today’s three action-packed Dunlop MSA British Touring Car Championship races at the Snetterton circuit in Norfolk. 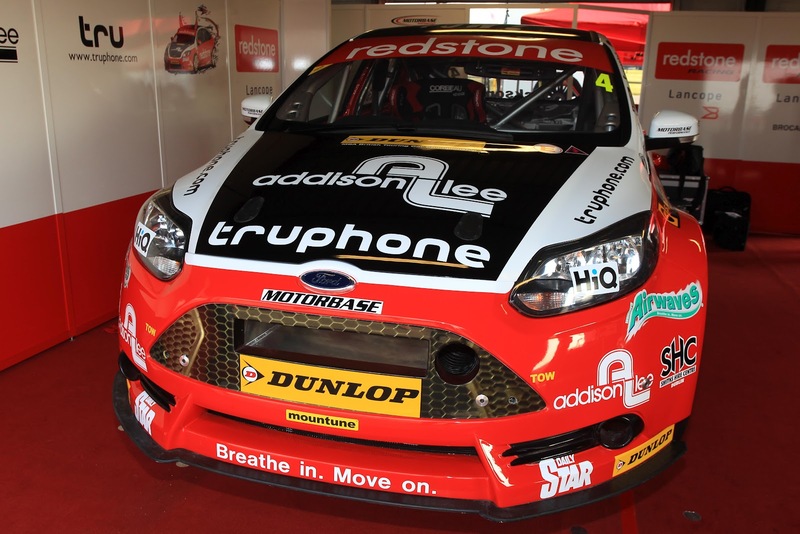 But it is Matt Neal who continues to lead the standings – just – from team-mate Gordon Shedden as the nation’s premier motor racing championship now heads to the latter’s home circuit of Knockhill, Fife in a fortnight on the weekend of 25/26 August. Preston’s Frank Wrathall had achieved his and his Dynojet team’s first BTCC pole position in Saturday’s qualifying session. Oxford’s Plato, though, got in front at the start of race one to take his third win of 2012 in his MG KX Momentum Racing MG6. 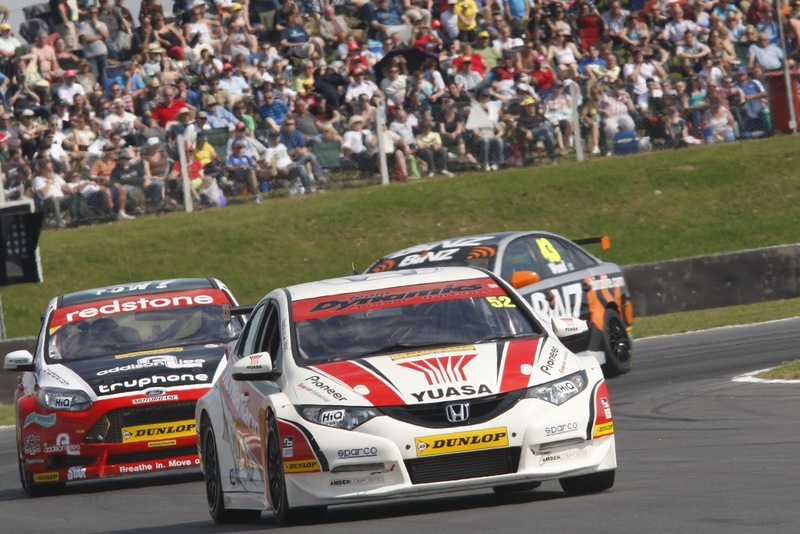 Wrathall was second in his Toyota Avensis and Jordan third in his Pirtek Racing Honda Civic. 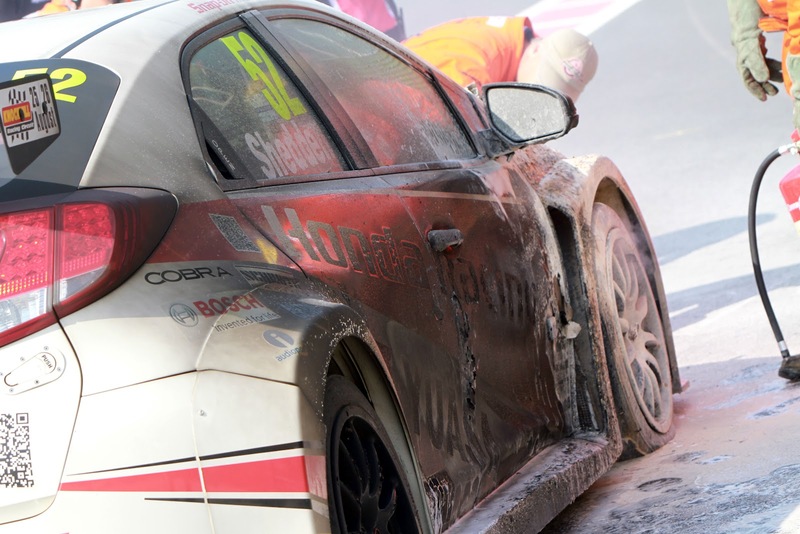 Lichfield’s Jordan took the win in the second race – his first of the season – but only after Plato’s MG and Worcestershire ace Neal’s Honda Yuasa Racing Team Civic had controversially collided and run off the track ahead of him with a lap to go. Shedden was second ahead of the recovering Plato and Neal in third and fourth. Inverness racer Newsham’s victory, his and the tiny Team ES Racing.com squad’s first in the BTCC, came in race three as he won comfortably in his Vauxhall Vectra. Tom Onslow-Cole was second in his eBay Motors BMW ahead of Plato who took another third. Lea Wood may well have achieved a maiden podium result had his BINZ Racing Vectra not cruelly retired with just a few laps to go, while Mat Jackson completed a hugely encouraging debut for Redstone Racing’s all-new NGTC-spec Ford Focus ST – only completed at 7.00am on Saturday – with a fourth-place finish. 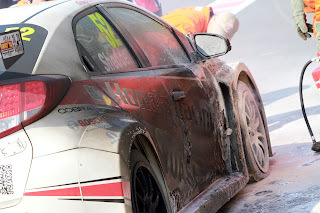 But there was a double disaster for the factory Honda squad as Neal finished a lowly eighth after a spin and Shedden, who had crossed the line in third, was later excluded for a technical infringement with his car. Elsewhere Honda/Dynamics and the Honda Yuasa Racing Team continue to handsomely lead both the Manufacturers/Constructors and outright HiQ Teams championships. Jordan has also extended his lead in the Independent Drivers standings and his Pirtek Racing outfit has taken command of the Independent Teams Trophy. Meanwhile a number of drivers were penalised for incidents at Snetterton today. Race 1: Robb Holland, official reprimand and two penalty points on his competition licence (for an incident with Adam Morgan); Dave Newsham, excluded (underweight car); Andrew Jordan, verbal warning (for an incident with Dave Newsham). Race 2: Jason Plato and Matt Neal, verbal warnings (for an on-track collision); Jeff Smith, official reprimand and two penalty points on his licence (for an incident with Andy Neate). Race 3: Gordon Shedden, excluded (for exceeding turbo boost limits); Frank Wrathall, verbal warning (for an incident with Matt Neal). Team ES Racing had a positive return to the Dunlop MSA British Touring Car Championship today at Snetterton when Dave Newsham qualified in third place, just 0.054 seconds away from pole position while team-mate and team principal Chris James finished the session in fifteenth. The day didn’t start well after radiator problems put Newsham out of the first practice session. Newsham made it out for second practice and soon started to signal his intentions as he set the second fastest time just behind Jason Plato. It took some time to set a time in qualifying after a red flag interrupted the first flying laps for the Team ES drivers. As the session resumed and the drivers headed out James was unlucky to pick up a puncture and had to limp back to the pits on a rim. Thankfully there was no major damage cause by the blow-out and James was able to resume the session promptly. The first flying lap of the session from Newsham catapulted him up the timesheets placing him second, just behind the flying Toyota of Frank Wrathall. As the session went on the times fell and the top three would be covered by just 0.054 seconds as the chequered flag fell. Team-mate James had been putting in consecutively faster laps and finished the session in fiftheenth, just 0.042 seconds behind Rob Austin, who himself was only 0.020 seconds off the pace of Andy Neate in the works MG.
Newsham added: “I’m happy with today, and I’m surprised at our pace in comparison to the NGTCs. We know we have great race pace as we did a long run this morning and were competitive times. Frank Wrathall narrowly beat Jason Plato to achieve his first BTCC pole position at Snetterton Norfolk. Frank Wrathall has spectacularly taken the first pole position of his Dunlop MSA British Touring Car Championship career at the Snetterton circuit in Norfolk. The 25-year-old from Preston achieved pole in a time of 1m57.595s in his Dynojet Toyota Avensis to pip former double Champion, Oxford’s Jason Plato in his MG KX Momentum Racing MG6 by just 0.015s. 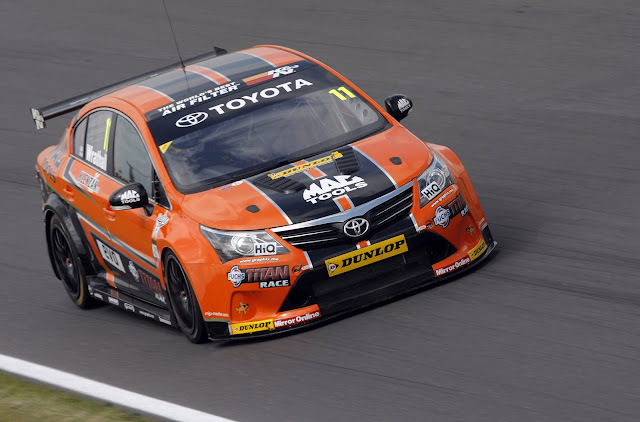 Wrathall’s pole is the first for a Toyota driver in the BTCC since 1993 and also a qualifying record for the championship around the Snetterton track. Inverness’s Dave Newsham was also close to pole, just 0.054s away from Wrathall in third in his Team ES Racing.com Vauxhall Vectra. There were career-best qualifying results, too, for Preston's Adam Morgan and Fleet's Daniel Welch – a fine fifth and sixth fastest in their Speedworks Motorsport Toyota and Welch Motorsport Proton respectively. That'll polish out. The mechanics had the car out later on. 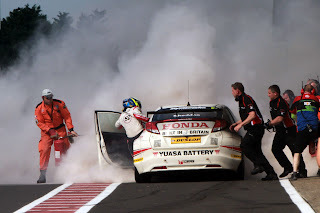 But there were major frustrations for the two championship leaders, Honda Yuasa Racing Team team-mates Matt Neal and Gordon Shedden. 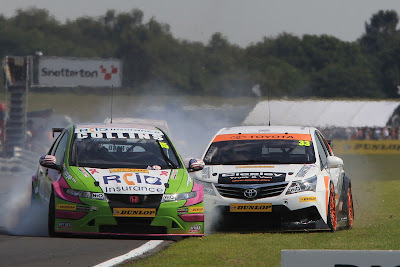 Worcestershire's Neal was a lowly seventh by his standards and Fife's Shedden 22nd and last after on-going problems with his Civic – which had suffered a major fire in practice this morning – prevented him from setting a time. 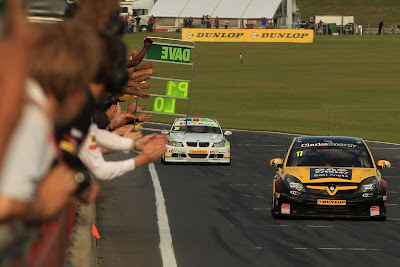 Meanwhile Neal will go into tomorrow’s three BTCC races at Snetterton leading the standings by a point from Shedden. Plato is a further 28 back with 20 awarded for a race win. All the action will be shown live on the ITV4 and ITV4 HD channels plus www.itv.com in a seven-hour show from 11.00am-6.00pm. The two Hondas squabble for position at Croft. Can they bring home success at Snetterton? 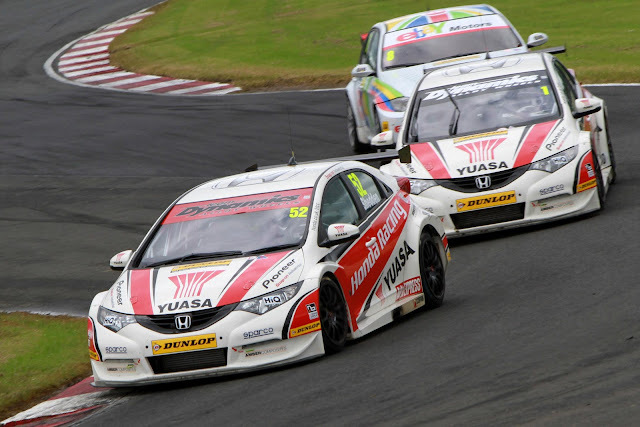 Matt Neal and Gordon ‘Flash’ Shedden will be defending their lead in the MSA Dunlop British Touring Car Championship as the Honda Yuasa Racing Team heads to Snetterton this weekend. After a long summer break, the duo will be making its second race visit to the 300 version of the Norfolk circuit, this time with the title-leading NGTC Honda Civics. Despite being at the top of the table, the squad has been working hard over the break so that it can continue its fine run. Work has been ongoing with the chassis as the boost restrictions in the series are still limiting the Civic’s straightline speed. 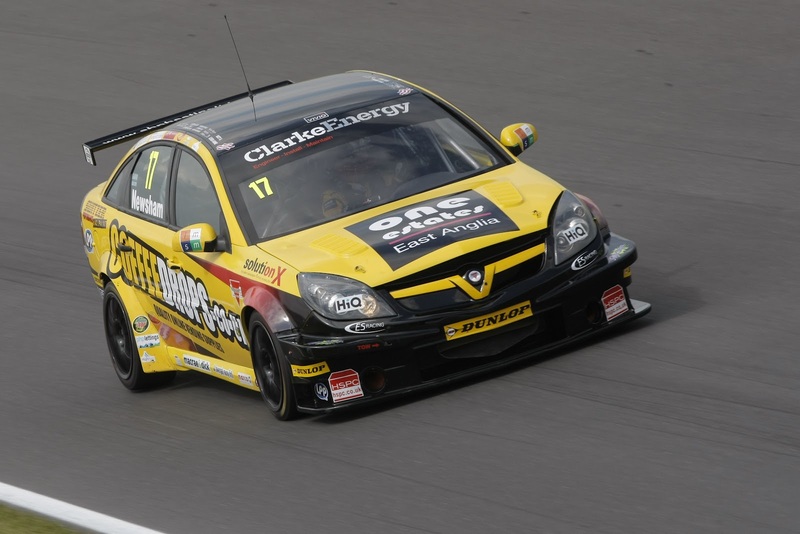 The triple champion had a difficult time at Snetterton last year on his way to the title, but he still likes the new layout, which was used for the first time in the BTCC in 2011. “We’ll get left on the straights at Snetterton, so we’ll have to work in the corners,” he said. “[MG driver and rival] Jason Plato will be there, and so will the Fords, but we should be in the mix again. Shedden, who is just one point behind Neal in the drivers’ table, did win a race at Snetterton last year and is not worried about the lack of testing he has had since the last BTCC round at Croft. “We had quite a few things we needed to make changes too and we focused on those rather than running,” he said. “There are a lot of corners at Snetterton, but there are a lot of straights too. You’re flat in sixth on the start/finish straight, again on the straight behind the pits, and again on the Bentley Straight. It’ll make it a bit tricky, but we’ll have to make the most of the corners. As well as leading the drivers’ table with its two stars, the Honda Yuasa Racing Team leads the team’s table and the manufacturers’ championship heading into the weekend. The Snetterton action gets under way at 09:35am on Saturday with free practice. Qualifying is at 3:15pm, and the first of three races on Sunday is scheduled for 12:00. The MG KX Momentum Racing team is back on track this weekend as the 2012 Dunlop MSA British Touring Car Championship (BTCC) resumes racing after a six week summer break. The Snetterton circuit in Norfolk will play host to rounds 16, 17 and 18 of the series, as the championship battle re-commences. It was a weekend of highs and lows for Jason Plato last time out at Croft, as technical gremlins within the MG6 continued to blight the Triple Eight team’s progress. Failure to see Jason take the start of Race One was disappointing for the MG KX Momentum Racing Team, however the squad was sent into the summer break happy as the double BTCC champion fought back to win Race Three in spectacular style. Andy Neate recorded his strongest BTCC weekend to-date with the MG6 at Croft, when he brought the car home for points paying finishes in all three races. It could have been even better for the young Englishman though, as he had impressively led Round Fifteen for the majority of the race. Having had a chance to catch their breath following the team’s late start to the season’s preparations, the second half of the BTCC season gives the MG KX Momentum Racing squad a chance to build on the team’s positive first six months of existence. The team will now look to push the established squads for glory, in what is still their maiden campaign. The charge towards the finish starts at Snetterton this weekend! The Rally2Raise team of Rachel Medich, from Aberdeen, and Katherine Begg, from Morecambe, enjoyed a very successful Speyside Stages rally last weekend when they had a troublefree run through the three stages they had been allocated to complete as well as raising over £340 for the four charities that the Rally2Raise project is supporting. The Rally2Raise car’s next scheduled appearance is at the Merrick Stages in South West Scotland which takes place on 1st September. Kev Monaghan is hoping that brand new Dunlop tyres supplied by new sponsor Stauff will help him challenge for a class win on next weekend’s Tyneside Stages rally on Otterburn army ranges. The event is round six of the MSA Asphalt Championship and despite not entering the last two rounds Monaghan presently lies third in his class championship, his points tally boosted by a class win on the last rally he contested. The rally starts on Sunday morning (11th August) and the crews will face around 90 miles of stages on the notoriously difficult ranges. Contesting selected rounds of the 2012 British GT Championship, Chevron Racing’s Anthony Reid and Jordan Witt piloted their Chevron GT3 to 7th place at Snetterton (on Sunday 05 August) equalling the highest ever finish for the marque in the series, although this time among a much bigger field. This is also the Chevron GT3’s highest placing in a British GT race – making it a new ‘personal best’. Despite a weekend of mixed fortunes for the team in Norfolk, the result for Reid and Witt in the second race highlights the success of Chevron Racing’s continued development of the GT3. However, due to tricky weather conditions, which resulted in less track time and qualifying being cancelled, the testing of the Chevron GT3 with newly fitted brakes was limited. “After Saturday’s wet weather, and the difficulties it brought with it due to the allocation of grid positions from practice sessions, we really wanted to push in the second race. Anthony handed the car over to me whilst lying in tenth, having come up through the field from near the back of the grid, and by this time the new brakes had bedded in. “The Chevron GT3 stayed strong until the end of the race, as others seemed to be dropping off the cliff. This is probably down to the fact that we suffered from less tyre degradation, mainly as a result of the Chevron being a lighter car. 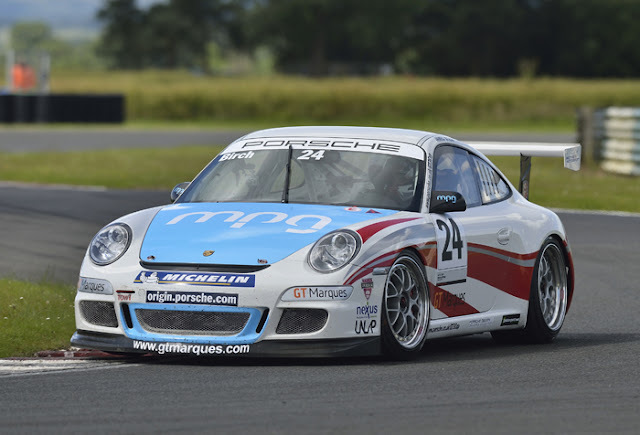 Anthony Reid commented; “We learnt a tremendous amount from the weekend, came away with a great result, and the team left Snetterton in good spirits. It was unfortunate about the weather on Saturday, but we were able to fight back on Sunday which was fantastic. 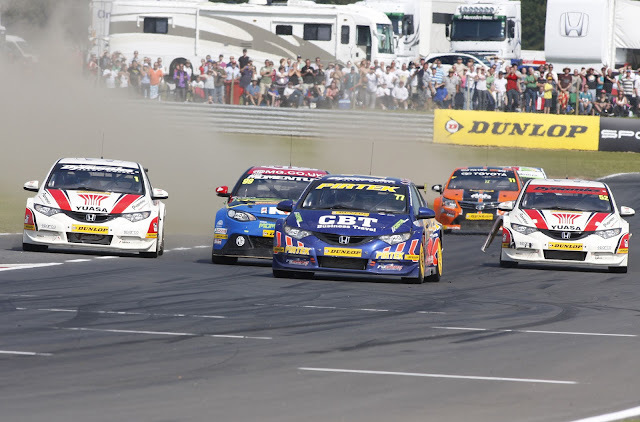 There is now little more than a week to go before the UK’s premier motor racing championship – the Dunlop MSA British Touring Car Championship – resumes its 2012 season at the Snetterton circuit in Norfolk (Sat 11/Sun 12 August), thereby continuing the country’s sizzling summer of sport. 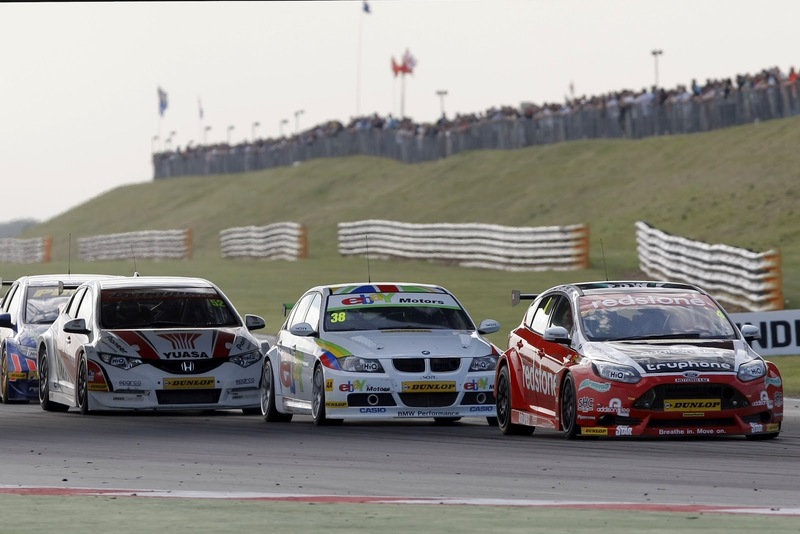 Like the finalists in an Olympic sprint, the BTCC’s star drivers will each want to be fastest out of the blocks as they return to action following a lengthy seven-week break in their calendar. Snetterton’s BTCC event makes for the Anglia region’s biggest motor racing fixture of the year and it is little wonder that, with swift access from the A11 dual carriageway, a bumper crowd is anticipated. Traditional scorching hot weather also adds to the appeal for fans and families looking to make a carnival weekend of it with their tents and barbeques. Meanwhile Attleborough’s Ollie Jackson will be hoping to shine in front of his home crowd in his AmD Tuning.com VW Golf but, with nine different car makes represented on the grid and 11 different drivers having achieved podium results in the season’s opening half, predicting who will come out on top at Snetterton is near impossible. 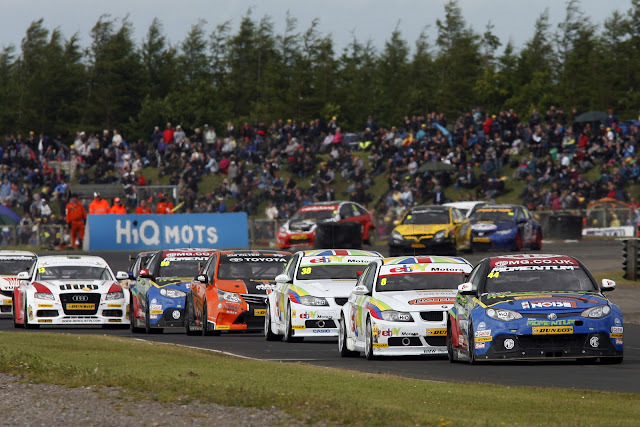 And while the headlining BTCC will be in race action three times on the Sunday (12 August), there are a further nine races for the supporting Renault Clio Cup, Porsche Carrera Cup GB, Ginetta Junior Championship and Ginetta GT Supercup categories in store for the visiting public during the weekend. Admission for accompanied children aged 12 and under is FREE all weekend with adult tickets priced at £25 (Sunday) or £31 (weekend) if booked in advance from the www.snetterton.co.uk website or the hotline 0843 453 9000. Admission includes access to the BTCC teams’ paddock and the specially organised autograph session for fans with their touring car heroes in the Snetterton pit lane. 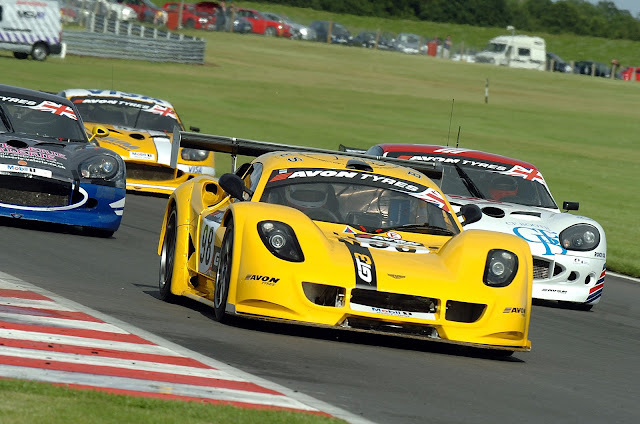 There is now less than a week to go before the UK’s premier motor racing championship – the Dunlop MSA British Touring Car Championship – resumes its 2012 season at the Snetterton circuit in Norfolk (Sat 11/Sun 12 August), thereby continuing the country’s sizzling summer of sport.